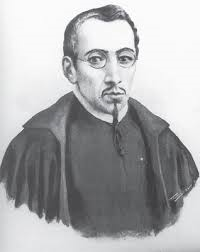 Carlos de Sigüenza y Góngora (1645-1700) was born and died in Mexico City. For a time he joined the Jesuits. He was a professor of mathematics and was both an astronomer and a geographer, creating the first map depicting all of New Spain by one of its citizens. Writing on the ancient history of Mexico, he speculated on the origins of its inhabitants suggesting that they arrived from Atlantis, which in turn had been colonised by Egyptians. His views in this regard were heavily influenced by the writings of Athanasius Kircher. He supported this contention with a list of cultural similarities, in particular, their use of pyramids. This idea of Atlantean migrants was adopted by a number of more recent commentators such as Rafael Requena.